Despite a serious lung disease, Cannonville resident Peter Moore wants to show what can be done and send out a message of inspiration when he tackles the river mile at the SPAR Summer Festival this month. The 54-year-old will take part in the disabled mile for the first time when the festival takes place in his home village outside Port Elizabeth on February 25 and 26. 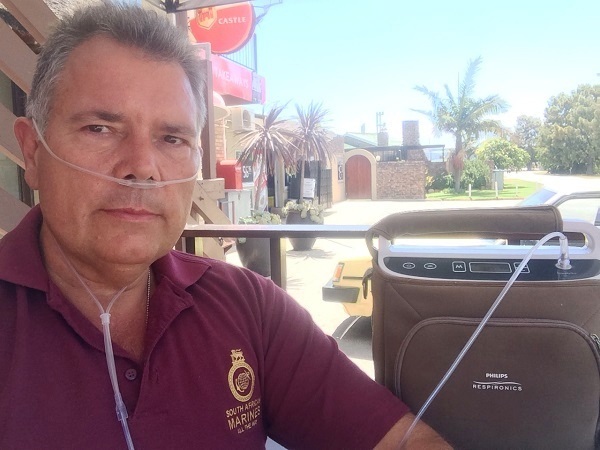 Moore, who grew up in Welkom in the Free State, said he wanted, as far as possible, to encourage members of the public to sign up as organ donors. Although he didn’t know it at the time, Moore’s problems started 24 years ago when he ran into a room to close a chlorine gas cylinder that had been inadvertently opened. He was working at a crèche in the Sandton Health and Racket Club in Johannesburg and took his actions so the children in the play area could be evacuated. Moore was told it would probably only affect him when he was older and about eight years ago he started experiencing problems. With a lung capacity that functions between 18 and 24 per cent, Moore said simple actions such as brushing his teeth would leave him exhausted. Two years ago Moore said he decided to start a comprehensive programme to try to manage his condition. “Just by tensing my muscles and doing breathing exercises, I managed within two months to walk on the treadmill for two minutes without stopping. Although he has lost enough weight to be listed for a transplant, he said due to lack of finances he no longer had private medical aid and state hospitals did not do lung transplants. Moore said swimming the river mile it would be the biggest challenge he would face as a COPD sufferer. “Swimming is one of the hardest things I can do. I spend most of my life feeling as if I’m drowning a little bit at a time. Moore said he would swim with his oxygen machine in a canoe next to him, with the flow of air being controlled by a friend dependent on his needs.